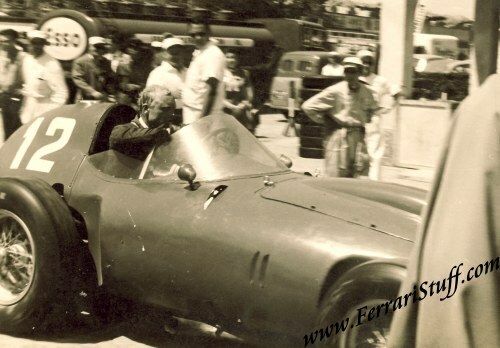 2 Vintage 1958 photos of Mike Hawthorn on Ferrari 246, Race of two Worlds, Monza. This lot consists of two photographs taken in the paddock preceding the 1958 Race of Two Worlds (or Monzanapolis) on June 29, 1958. The first photograph shows Mike in his # 12 Ferrari 246 and the second shows the same car surrounded by the crowd. The race of Two Worlds was basically an exhibition event to show both American and European teams to the public and was held in 1957 & 1958 at the banked track of Monza. 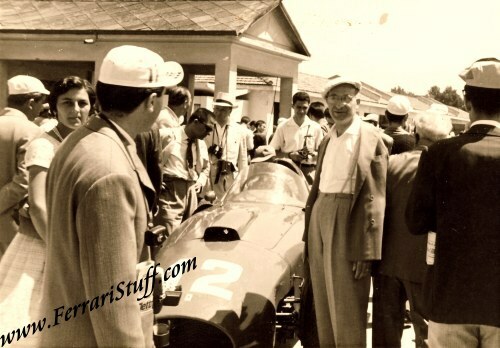 These photographs date from the 1958 event and quite an event it was for Ferrari! In the first heat (of 3) Luigi Musso succumbed to the methanol fumes and handed his car over to Mike Hawthorn in lap 27. Musso returned to the wheel in the last lap and brought the car home in 6th place. In the third heat, Mike suffered the same fate as Luigi did in the first and handed the car over to Phil Hill who brought the car up to third place before handing it back to Mike again. All in all, not a great success for Ferrari! These are vintage photos, i.e. they were printed shortly after the image was captured on film. Each photo measures some 10 x 7 cm or 4 x 2.75 inches and are in excellent condition. The backs carry some notes but NO photographer's stamp.